HRI conducts the online element of their raffles through CFP Lottery & Raffles Ltd - a registered External Lottery Manager (ELM) licensed by the Gambling Commission. CFP Lottery & Raffles Ltd operate a platform which complies with all relevant codes and remote technical standards. HRI will only use gambling software (a Random Number Generator (RNG)) produced by CFP Lottery and Raffles Ltd which has been approved by the Gambling Commission. All funds from your online ticket purchase are credited to a client account held with Natwest on behalf of raffleplayer.com, which is entirely separate from raffleplayer.com’s trading accounts. This is a key requirement of the Gambling Commission's licence compliance and is there to protect both you and the charity. When a raffle takes place, proceeds are paid directly from this account to the charity. 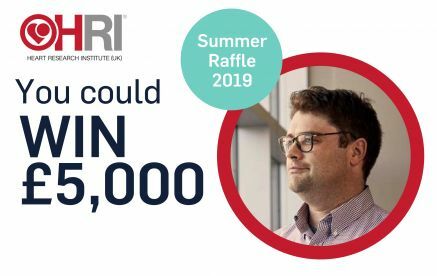 HRI will reserve the right to offer alternative prizes of equal value if, due to circumstances beyond its reasonable control, the stated prizes are no longer available. In the event that a telephone or online complaint cannot be resolved by the ELM (CFP) or representatives of HRI, CFP will provide free third party arbitration via IBAS. In the event that a written complaint cannot be resolved by the ELM (CFP) or representatives of HRI, CFP will provide free third party arbitration via IBAS. Chances may only be purchased once the player has self-certified that they are over the required age to play. Any online player that is found to be under the required age to play will have any monies paid in relation to the lottery returned to them. Our website carries information encouraging people to gamble responsibly, and recognise the signs of problem gambling. We also include the National Gambling Helpline and begambleaware.org website details for people to refer to should they need further help. The National Gambling Helpline number and Gamble Aware website address is included on all tickets and entry forms to lotteries as well as our website address that includes information on gambling. Players can request a self-exclusion to be added to the HRI database so that they are removed from further addressed lottery communications including post, telephone, email and SMS. All self-exclusion requests along with the date of the request will be captured on to the record on the HRI database and will be in place for a minimum of six months. All reasonable steps will be taken to prevent any self excluded individuals participating. Players must be over the age of 16 to purchase chances. Players will not be able to proceed to the payment page until they have self-certified that they are over 16 years old. Once payments have been successfully processed, a confirmation email is sent to entrants confirming their playing status. This email includes a self-certification statement confirming the entrant is over 16 years of age. The minimum age for play is 16 and is detailed on the back of all tickets and entry forms produced. Any player who is found to be under 16 years of age will have any monies paid in relation to the lottery returned to them.